the year of 2012 is over and our efforts start to bear fruits. Together, we are able to allow many children to attend school or an apprenticeship. Furthermore, we have advanced our children’s centre and increased our efforts in the education of the public about the needs of disabled people. We want to thank you all for you support and your commitment. We welcome two new members: Claudia Neumann and Friederike Geiger have joined our team in Germany. 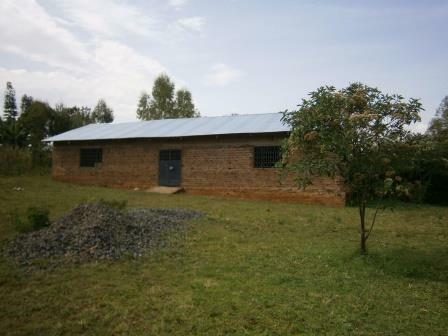 The first house of the centre is finished. The construction advances day by day. Due to heavy rainfall, we are slower than expected but the first house is already finished. We hope to open the centre by the end of the year. Our partner school for internships is the Ebukuya school near Luanda. We are looking forward to new interns in 2013. The team in Kenya educates the public about the needs of disabled people. They offer course in Sign Language and workshops concerning deaf culture and deafness. We were able to support 20 children with the help of our sponsors. Due to rising costs in Maseno, we had to raise the sponsorship fees in 2012. 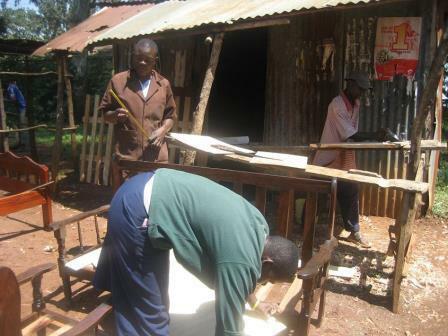 Victor Otieno finished his carpenter apprenticeship. His success motivates us in our work. We were able transfer 6,520 € to Kenya this year. We are motivated to continue our good work in Kenya and in Germany. Besides our sponsorship, we focus on finishing the children’s home.